America the Racist? re-published to give insight to stop killing black men and police officers and change the paradigm of racism that created "black lives matter". The author believes the headlines of police brutality, killing of unarmed black men and of 5 police officers is the tip of the iceberg of a paradigm of racism that has framed America from the Declaration of Independence to tomorrow's headlines. "America the Racist?" examines this paradigm that, unchecked, can destroy the soul, body and credibility of America. "Racism can destroy America", says H. J. Harris author of America the Racist?, a must read for white and black Americans as current events unfold from police shootings of black men, the racist massacre of 9 black Americans in a Bible study class is Charleston, South Carolina, to the killing of 5 police officers in Dallas, Texas. 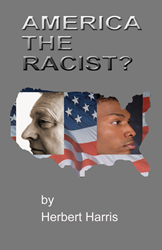 America the Racist?, a 172 page book sets forth a concise, easy to read, historical, spiritual, and psychological treatment of Racism in America - its causes, evolution and possibilities for the future. "Once we understand why we are where we are as a nation, then we are better equipped to determine what must be done for America to truly become the “one Nation under God” described in Dr. King’s dream and in the Pledge of Allegiance." states Harris. According to the author, "many Americans thought that the scourge of racism was finally over with the election in 2008 of the first African American President Barack Obama, It appeared that America had finally faced the spiritual dilemma of racism and delivered on its creed of equality and justice for all. White and black Americans together elected the first African American President in history." However, Harris states, "Immediately after the election of President Obama, a loud raucous segment of America emerged, seeking 'to take our country back'". The true meaning of “take our country back” was never publicly defined. To Black Americans it meant a desire to return to the days of “Jim Crow” - of institutional racism that has defined America since its inception." Harris sees news headlines of police brutality, the killing of unarmed black men and the killing of 5 police officers as the tip of the iceberg of a paradigm of racism that has framed the true meaning of America from the Declaration of Independence to tomorrow's headlines. "The shooting death of Michael Brown in Ferguson the shooting in the back of unarmed Walter Scott, in Charleston, the shocking death of Eric Garner in New York City, the killings of Philando Castille and Alton Sterling are all part of the many instances of fatal interactions between black men and police," claims the author. The "black lives matter" movement grew as a response to perceived callousness and brutality of police actions toward black people. A chapter in “America the Racist?” entitled “Thank God for Television” shows how many white Americans are in total denial of the existence of racism in America until videos surface that show what is really happening in this country. Harris states that "Some white Americans go so far to maintain that state of denial that they actually claim that these racial divisions are caused by President Obama. They actually proclaim that if it were not for President Obama, these racial issues would not exist." Harris believes that the racial discourse that now dominates the news and politics clearly indicates that the information covered is this book is critical to understanding and resolving the paradigm of racism that has been a cancer on America since its inception. America the Racist? shows why the cancer of racism is so deep that many black and white Americans are not able to get beyond the ingrained racism they have been taught from the cradle to the grave since the beginning of this nation. America the Racist? reveals why the Paradigm of Slavery created and perpetuated by many white Americans must be replaced by a Paradigm of Freedom that can only be created by black and white Americans working together with a mutual understanding to build a New Vision of “one nation under God”. 1. How the Declaration of Independence and the United States Constitution were impacted by signers who owned slaves and endorsed slavery. The slavery issue was a deal breaker since many of the original signers of the Declaration of Independence owned slaves..
6. How racism has impacted every facet of American life from sports to law enforcement, from military service to the color of God. There was a time in the not so-distant past when black police officers couldn’t arrest white people, or a black umpire could not call a white baseball player out at the plate. 10. Why the power of television was the single most important tool in showing the truth of America racism to the world. Without television, America's moral compass is an illusion. 12. Why the Presidency of Barack Obama has removed the scab from the festering sore of racism that is poised to destroy America as a spiritual contradiction to the Christian principles on which it was created. It is for these reasons, the urgency of NOW, that the publisher has elected to re-publish America the Racist? and make it available as a light to show the way forward. A book overview or ebook version is available to reviewers by email to info(at)americatheracist(dot)info or by calling 800-570-4009. Publisher: New Paradigm Publishing, P.O. Box 302, Wilmington, NC 28402; (800) 570-4009.